We broke out the calculators and a crystal ball to clarify what you should be rooting for over the next fortnight. 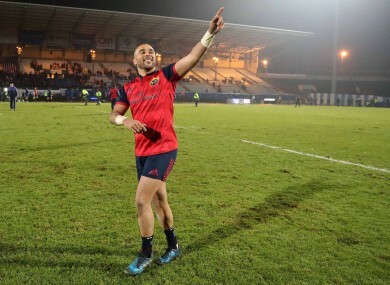 NOW THAT MUNSTER have played their rescheduled match against Racing 92 to leave everyone in Europe’s top club tournament with four games on the baord, let’s look at who needs what from rounds five and six in order to call their Champions Cup run a success. First, a refresher on the tournament format: The five pools of four teams are vying for eight quarter-final spots. The five pool winners will automatically take a berth, leaving three spots open for the best-performing runners-up. When it comes to the shake-up, teams level on points with a team in their own pool will be ranked based on the results of matches played between those sides in the pool. For example: if Wasps and Connacht finish level on points, then Wasps would finish above the Westerners as they took six match points from the two encounters versus Connacht’s four… if that figure was level, then it would go to aggregate scores and then to tries scored. Provinces and clubs will also be competing against teams in other pool for places, so every single penalty, drop-goal and try counts. Sides who are level on points and placing with a team from another pool will be separated by the best points difference (points scored minus points conceded). In the unlikely event of that being level, tries scored will be the deciding factor. And the last option before drawing lots will be to compare the suspensions picked up in the pool stage. Why all the fuss over who’s ranked where? Because the four pool winners with the best records will play their European quarter-final on home turf and the fifth table topper and three runners up will have to travel to meet them. Here’s how the ranking currently looks with two matches to go (points difference in brackets). Clermont Auvergne: 17 points (+55). As you can see, Ireland’s traditional provincial powers are nestled in home quarter-final berths as we enter the final two rounds. Connacht have the same number of points as the fifth and sixth-ranked sides in their pool, so must also hold some hope of climbing. Let’s start with the lowest-placed Irish side. Winning Pool 5 is no longer a runner for the northern province as they are eight points off Clermont, who need only win win one of their remaining two games to seal the pool – two points will be enough to ensure they stay ahead of Ulster. Being one of the best runners-up is still possible. Stade Francais and Northampton squeezed into the last eight with 19 points last season, edging Ulster (18 points) out. Another late burst might just be enough this time around – with a little help from their friends. Look at eighth-ranked Montpellier: they ought to beat an out-of-sorts Northampton with a bonus point in round six, but if Leinster can beat them well in the RDS in round five they would be stuck on a total of 16 points. That’s a gap of seven pool points to be made up in clashes away to Exeter and at home to Bordeaux – who we must hope don’t go and beat Clermont to make it a tussle for second place. Tough, but far from impossible for an Ulster team packed with internationals. The Pro12 champions are also sitting third in their own group, but they are level on points with their rivals in Pool 2. Toulouse have the toughest close to the pool stage as they have already faced Zebre twice. However, they will have home advantage against Connacht in round six. Both Connacht and Wasps will count a bonus point win over Zebre as absolutely essential, so let’s assume both teams have a base of 18 points. As we outlined with Ulster above, that figure may be enough to take a quarter-final berth, the trick in this case is finishing in the top two of the pool. With the pool so tight, don’t expect to see any team taking their foot off the pedal Northampton / Racing style in the closing rounds. If Wasps beat Toulouse next weekend, they will almost certainly win the pool – as Connacht would need all 10 remaining points available to stand any chance of beating them. Having lost out 23 – 21 at the Sportsground, the French giants would still be confident of overtaking the Westerners on home turf – particularly given Connacht’s injury-ravaged state – but stranger things have happened. The remaining two provinces are playing with house money. They are in control of the pool entering the final straight, but must remain focused if they are to bring a big April fixture to these shores. The 7 – 32 win over Racing leaves Munster knowing that a win in round five will secure the pool and they could focus on racking up another big points differential when ROG’s Racing go to Limerick. Should Munster lose in Glasgow though, Gregor Townsend’s side would take over top spot and we’d be left hoping that Aaron Mauger gets Leicester digging into their pride reserves again to stop the Scots building on their advantage. The round six clash with Racing Metro should be a straightforward bonus point as the French champions will likely send the Espoirs again so they can focus on improving their Top14 standing. If Munster were to finish with at least 21 points, then the Warriors would need to win both of their games and get at least one bonus point to stay ahead of the southern province (while denying Munster a losing BP in the process. If the Warriors and Munster end up level on points at the end of six games, Munster would likely hold the upper hand thanks to their 21-point margin of victory over the Scots a week after Anthony Foley’s death in October. With their nearest challenger in Pool 4 coming to visit the RDS on Friday night, Leinster have reason to be confident of wrapping up the pool with a game to spare. So their eyes will be on maximising their points haul to challenge Clermont and Saracens for top seeding. Assuming they do go and beat Montpellier this week, Leinster must simply stay ahead of the Pool two winner’s points total (Wasps, Connacht or Toulouse) which can not go beyond 23. So two wins of any shape will guarantee a big Aviva Stadium match in the spring. The trouncing of Northampton Saints at the Aviva had given them points differential head start, but Munster are hot on their heels having played their game in hand. Leinster will want to train their sights on overtaking teams ranked above them where any slip from Saracens or Clermont will allow Leo Cullen’s men climb into the very top echelon, but the heat from their old friends Munster can’t be ignored.